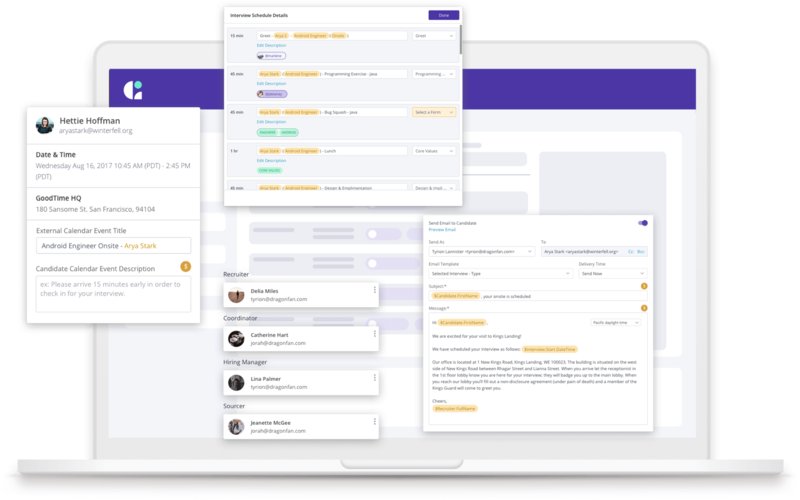 Automate your interview scheduling process so that your team can focus on hiring the right candidates, faster. Simply set up your interview and let your candidates select a time. We’ll take care of the rest! Select interviewers yourself or let us pick! GoodTime chooses the most optimal set of interviewers based on interviewer attributes and required skill sets. GoodTime integrates with an interviewer’s calendar to provide real-time availability. Candidates select a date/time and can even self-reschedule if needed before their interview. As soon as the candidate selects the date/time for their interview, GoodTime automatically syncs with everyone's calendar and your ATS so everyone’s on the same page. On-site interviews with a sequence of multiple events happening one after the other? GoodTime easily finds a time that works for everyone. Automate presentation interviews so every panel interviewer is added to the presentation. Ensure candidate feedback is captured quickly by automatically adding debrief meetings after your interviews. Schedule culture meetings like lunches and breaks with team members while you let your candidates refresh and refuel. Conference rooms are scarce resources at most companies. Manage and book the right sized conference rooms with necessary equipment for every interview. Overwhelmed by Reschedules? Fear no more! More than 50% of interviews get rescheduled. With automated scheduling, a candidate can easily reschedule directly from their interview confirmation. We understand how frustrating it is to have last minute cancellations and declines. We make rescheduling a breeze by providing a list of replacement interviewers, dates, and times that work for both your interviewers and the candidate. We scan and notify you in real-time of potential hard and soft conflicts. This enables you greater flexibility when scheduling. Ready to automate interview scheduling with the best-in-class Interview Logistics Platform?